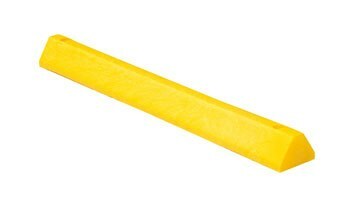 48 inch yellow Car Stops protect people and property from drivers in dangerous areas. Constructed of solid rubberized recycled plastic. One person installation. Can be moved for seal coating, snow removal, change of location. Resists marring by oil, road salt, sunlight, and chemicals. Resists rotting, termite damage and corrosion. No costly painting or maintenance. Hardware kits sold separately.